I'm a pepper, your a pepper, she's a pepper, he's a pepper, wouldn't you like to chop a pepper too? So I chopped them all up real purdy like and though the recipe didn't call for it, I added a few cloves of garlic using my handy dandy garlic zoom, mostly because I couldn't resist using the cute thing! Then I dumped each thing into the pot one at a time, sauteing in butter a few minutes each just like she recommends. After the peppers, butter, onions, and garlic, the next thing I added was the bacon, then flour, seasoning, the chicken stock, the milk, etc. One thing I changed was the amount. We have three little girls, so technically I'd be cooking for 5, however they eat like birds most of the time and tend to frown on my cooking experiments as actual "edible" food, so in reality this is just for hubby n me. So instead of doing 3 cups of stock, I did 2, and instead of 2 cups of half/half I did 1 cup. I did add the whole amount of cheese though, because really, you can never have too much cheese, no? So I let it simmer on low and get all nice, thick and bubbly. Didn't have bread bowls on hand but had a crusty loaf of french bread that went nicely with it. Hubby seemed to really like this soup. I thought it had a nice warming effect. The peppers were very mild and added just a hint of heat. The kids on the other hand, wanted NOTHING to do with it. This is despite the fact they love corn and cheese in any amounts. I do think the bell peppers gave this soup a more "grown up" taste, hence the shunning. We should probably put this into the grown up soup arsenal around here. This is the 4th soup I've made from scratch in the last few weeks, and I'm really starting to get the hang of how easy and tasty homemade soup can be. I am new to pinterest and using the computer. 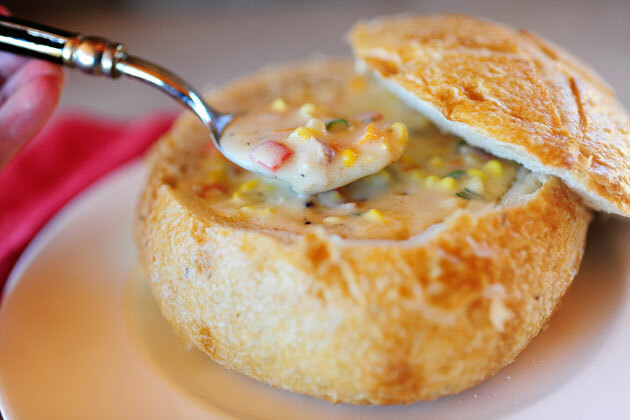 Your corn and cheese chowder looks great but I don't think it said how much corn or cheese. Did you us frozen or canned corn and what kind of cheese do you recommend?? Thanks, sorry to be a bother. Sure no problem. Since I was trying out the pioneer woman's recipe, I was just using her amounts. If you click on the link to her blog she lists everything out in detail. Hope that helps. :) She uses like 5 ears of fresh corn, but I believe for this recipe I just used 2 cans of drained corn. Also for cheese I tend to use Tillamock cheese from the northwest area. It is mild and melts really well.